A Co Down motorist involved in a fatal road collision which claimed the life of a 69-year-old man has been banned from driving for three years. William Mark Murphy was driving a lorry which collided with a tractor pulling a trailer on the A4 dual carriageway between Dungannon and Ballygawley. The fatal incident, which occurred at the junction of the Killybracken Road on June 25, 2014, resulted in the death of Caledon father-of-four Phelim Brady, who was standing on the drawbar of the tractor when it was hit from behind by a lorry driven by Murphy. 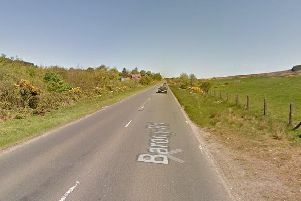 From Prospect Road in Castlewellan, Murphy, 53, was given a driving ban and was also handed a four-month prison sentence, which was suspended for three years, for causing Mr Brady’s death by careless driving. Dungannon Crown Court, sitting in Belfast, heard that Murphy had been driving in the inside lane and had gone to overtake the slow-moving tractor and trailer, but was forced to abort the overtaking manoeuvre after failing to see a car travelling in the outside lane. He swerved back into the inside lane, however Murphy was too close to the back of tractor towing the trailer, failed to brake in time and subsequently impacted into them. The court heard that Mr Brady sustained “multiple injuries as a result of the collision” and died at the scene. During Tuesday’s sentencing, Judge Neil Rafferty paid tribute to the “tremendously dignified and decent” Brady family, who have been devastated by the loss of a loving husband, father and grandfather. Judge Rafferty said that having read victim impact reports, it was clear Mr Brady’s loved ones had “lost the bedrock of the family unit”. As members of Mr Brady’s family sat in the public gallery, Judge Rafferty said they had been dealt a huge blow” by his loss – but said that no sentence he passed would bring the deceased back. Murphy denied a charge of causing Mr Brady’s death by dangerous driving, and following a trial held earlier this year, he was found guilty by a jury of the lesser charge of death by careless driving – a charge he accepted from the outset. Defence barrister Kieran Mallon QC described the fatal collision as “absolutely tragic” and said there was nothing to suggest Murphy saw Mr Brady as he stood on the drawbar of the tractor. The barrister said that since the incident, Murphy has been “absolutely consumed with grief and remorse”.